Perhaps one might want to consider where are the Jains naked ascetics nowadays , because those events took place at the same time along with the Buddha and Hinduism . Does the naked ascetics or any traces could be found in Sri Lanka ? Based other buddhist texts and Agama translation texts where it's brought back from India to China by Indian monks and Chinese monks and including the commentaries written by Chinese monks , seems to contradict many things . The ancient kingdom of Magadha is heavily mentioned in Jain and Buddhist texts. It is also mentioned in the Ramayana, the Mahabharata and the Puranas. The Mauryan Empire and Gupta Empire, both of which originated in Magadha. Also , Jain texts tell how Ajatashatru used two new weapons: a catapult, and a covered chariot with swinging mace that has been compared to a modern tank. So, does the Magadha site anywhere to be found in Sri Lanka ? Well, the island produces Buddhas in cycles. Kashyapa, Gotama and so on. The current cycle belongs to Gotama. When the cycle ends the Dhamma deteriorates and the noble truths are forgotten. People go back to deity worship and people just live by the 5-precepts. Once the super-mundane path is forgotten the Brahma realm becomes the highest attainment possible with the prevailing knowledge. When the Gotama Buddha emerged there were 64 different faiths in the island. This would have included Veda, Upanishads and Jain teachings. Although everyone adopt the Buddha Dhamma with Royal patronage once the Buddha emerges. Also , Jain texts tell how Ajatashatru used two new weapons: a catapult, and a covered chariot with swinging mace that has been compared to a modern tank. So, does the Magadha site anywhere to be found in Sri Lanka ? I do not know have a complete picture with regard to the Chinese Agama's and the Ramayana etc. If its Maghada of Jambudipa then it has to the Maghada of the island. So I suppose you have to re-visit the history leaving aside pre-conceived notions. Do not forget Mahavira , where in Sri Lanka about Him missing here in your story and of course the naked ascetics disciples roaming around in Northern India not in Sri Lanka . The place of Mahavira death, Pavapuri (now in Bihar), is a pilgrimage site for Jains. Well, this is how the "Jambudipa" is depicted in a 15 ce Jain Temple. This map would not exist if the island had nothing to do with the Jains - isn't that so? 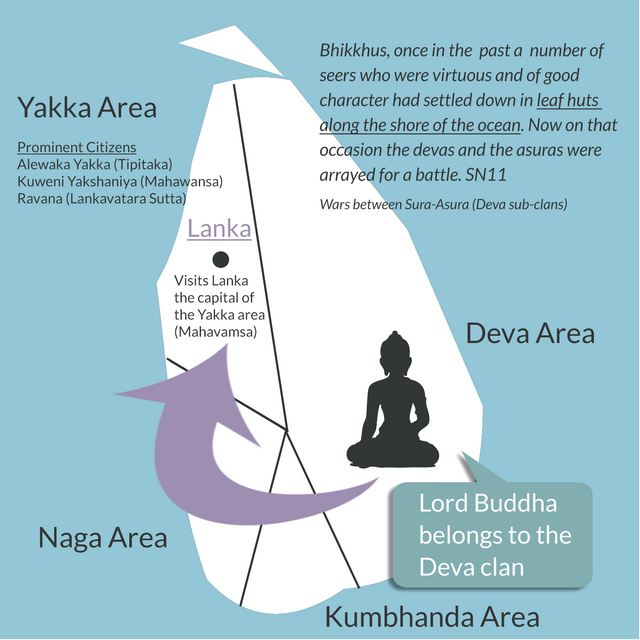 The entire Buddha history including the Askoka empire is from Sri Lankan Chronicles. The historians used the Sri Lankan ones to build a history for India. None of Indian history is based on Indian works. That's not so. In their reconstruction of the history of Indian Buddhism modern historians use a range of Indian, Sinhalese, Tibetan and Chinese chronicles. See the bibliographies in Etienne Lamotte's History of Indian Buddhism or A.K. Warder's Indian Buddhism. There are some missing information particularly with regard to Asoka but there is enough and more to prove Buddha was born in the island. Dīpāgamanaṃ buddhassa dhātūnaṃ bodhiyāgamaṃ ... kittiyissaṃ. If Laṅkā were Jambudīpa then there wouldn’t have been any ‘coming’ (āgamanaṃ), for the Buddha’s relics and the Bodhi tree would have been there all along. • Asoka had two coronations: an earlier one that made him King of Jambudīpa and a later one that made him King of Laṅkā. Laṅkādīpo ca paṇṇatti Tambapaṇṇi’ ti ñāyati. • At the time of the Buddha’s parinibbāna, Prince Vijaya, son of Sīhabāhu and the first Ariyan [in the ethnic sense] to rule Sri Lanka, travelled from Jambudīpa to Laṅkādīpa. Sīhabāhussā’yaṃ putto Vijayo nāma khattiyo. • Princess Kaccānā, daughter of the Sakyan Paṇḍu, travelled from Jambudīpa to Laṅkādīpa in order to preserve Vijaya’s dynasty. Tissārāma is another name for the Mahāmeghavana in Anuradhapura. In conclusion, if you want to resort to conspiracy theory to bolster your nationalist conceit, you’ll need to go much further back than the twilight days of the British Raj. To judge from your nation’s chronicles, it must have been the ancient Sinhalese themselves who fomented a plot to deny their island the honour of being the Buddha’s birthplace! This idea fails Occam's Razor, hard. The said chronicles make it abundantly clear that Jambudīpa and Laṅkādīpa are two different places. I could explain in length hoping you'd understand. However, I think its better if I can guide you to understand the problem yourself. Excuse me for having to answer a question with another question! I promise to re-visit your post once you have returned with some feedback. Are you able to describe the story described in Atanatiya Sutta briefly? So I expect the individuals involved and a summary of the what takes place in a few sentences. However, I think its better if I can guide you to understand the problem yourself. Excuse me for having to answer a question with another question! There’s really no need to apologise, for I didn’t ask you any question at all. I cited a Sinhalese chronicle to show the unfoundedness of your theory. I chose the oldest one, the Dīpavaṃsa, though in fact virtually any of your country’s chronicles would have sufficed, for they’re all full of stories about people journeying across the ocean from Jambudīpa to Laṅkādīpa and from Laṅkādīpa to Jambudīpa. So clearly your less geographically challenged ancestors considered these to be two different places separated by sea. The thirty-second sutta of the Dighanikāya, taught at the Gijjhakūṭa (D.iii.194 ﬀ). The Four Great Kings (Cattāro Mahārājāno) having set a guard over the four quarters, visited the Buddha. Having saluted him and sat down with hosts of other yakkhas, Vessavaṇa told the Buddha that the yakkhas did not, for the most part, believe in the Buddha for the reason that they did not find it pleasant or agreeable to abstain from the things which he declared to be evil — such as the taking of life, theft, etc. And in order that the Buddha’s disciples, haunting lonely and remote parts of the forest where the yakkhas dwelt, might find protection from them, Vessavaṇa suggested that the Buddha might learn the Āṭānāṭiya word-rune (rakkha). The Buddha agreeing, Vessavaṇa proceeded to recite it. It opens with a salutation to the seven Buddhas, beginning with Vipassī. The remainder contains a list of the gods and other superhuman beings, the Four Great Kings heading the list; these last are described at some length; forty-one other gods are mentioned as a kind of appendix or afterthought, all mentioned one after another with no attempt at group division and without any details, in what are, apparently, mnemonic doggerels. A part of the Mahāsamaya Sutta (sections 10‑20) looks very much like an improved and enlarged edition of this list of bare names. The Āṭānāṭiya Sutta is now regarded as a Paritta, and its influence pervades a hundred million world systems (VibhA.430). In Sri Lanka, for instance, it is recited with great fervour at the conclusion of the Paritta ceremonies, particularly in times of illness, in order to ward off evil spirits. It is included in the list of Parittas found in the Milindapañha, p.151; on the importance of this sutta in the history of India, see Rhys Davids, Buddhist India, pp.219‑37. DA.iii.969 gives a long description of the ritual to be followed when reciting the Āṭānāṭiya Paritta. As for the individuals involved, there are dozens of them: past Buddhas, yakkhas, kumbhaṇḍas, gandhabbas; some named and some not. Who in particular would you like to know about? The "4 Great Kings" belonged to the areas shown here. The relics are taken from Jambudipa (Deva Area) to Lanka in the Yakka area. Whenever you see a "Lanka" reference in the chronicals - it means the capital of the Yakka area. This is where Vijaya supposedly landed and met Kuewni - the Queen of the Yakka area. King Devanampiyatissa ruled this area. The Sri Lankan govt official records it indicates "Jambudipa" as one of the names. Lord Buddha was not born in Sri Lanka. "Micchādiṭṭhiṃ micchādiṭṭhīti pajānāti. Sammādiṭṭhiṃ sammādiṭṭhīti pajānāti. Sāssa hoti sammādiṭṭhi." so if ur born into the realm of the four great kings? your just born in sri lanka? how disappointing. so what are Tusita and Paranimmita Vasavattī? first world countries? So elaborating some more would help is't it? so if ur born into the realm of the four great kings? your just born in sri lanka? There is no "realm". The "Deva" has been wrongly misinterpreted as a Deva realm. Although its not so. There is a Deva realm and also a Deva clan/tribe. The Deva clan are just normal human beings. so what are Tusita and Paranimmita Vasavattī? Tusita would be a Deva town. Paranimmita Vasavattī is the 11th Deva relam . These not not human beings.